This fabulous butter cream icing recipe is attributed to Cook's Illustrated. The best part, besides the fact that it's easy to make, is that you can make it milk chocolate, dark chocolate, or use a combination of both. I like to use either Ghiardelli chocolate or E. Guittard chocolate and mix half bittersweet and half semi sweet. This original recipe makes a whole lotta icing, more than enough to cover three 9" layers. I have included ingredient measurements to cover two 9" layers below. 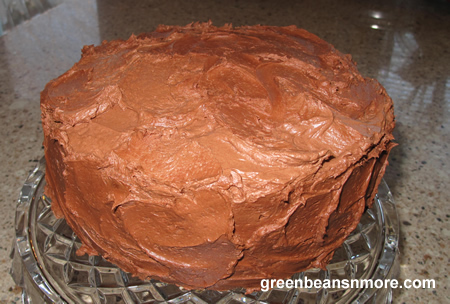 This chocolate frosting is a perfect pairing with this yellow cake recipe from Eve's Restaurant. Heat the cream, corn syrup and salt on the stove until simmering. Meanwhile, chop the chocolate in a food processor. With the processor running add simmering cream slowly and process for one minute, until the chocolate is melted. Add powdered sugar and vanilla and process again. Then, with the processor running, add butter one piece at a time, waiting until each piece is incorporated before adding another. Cool until thick and spreadable. For a lighter, more buttercream frosting beat with an electric mixer before spreading. Cook's Tips: The most important thing to remember is that this chocolate icing will only be as good as the chocolate you use. Use a good chocolate, such as E. Guittard or Ghiardelli. In your searches you may see others say they made this icing using a stand mixer and had no trouble. Not me. The first time I made this recipe I used the stand mixer. The stand mixer cooled the chocolate way too fast and the butter didn't want to incorporate. It was MUCH EASIER the second time around using the food process. Use a stand mixer for this recipe at your own risk. Also, if you put this icing in the refrigerator it will get very hard. It's best served at room temperature.